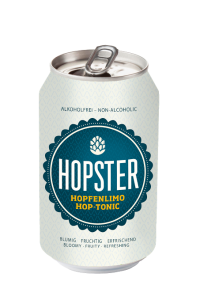 Hopster is a clear, tonic-like soft drink flavored with—well, you know. Its relatively low sugar content and exquisite blending of lemon flavors, green tea, and four varieties of noble German hops instantly distinguish it from the far more sweetened competition and, indeed, from any other soft drink in the world. The brainchild of Jonas Seidl–a graduate of the famed Weihenstephan brewing institute near Munich–the original Hopster was first test-marketed in 2012 after five years of experimentation. In the summer of 2013 the Shelton Brothers were introduced to it by Stephan Michel at his Mahrsbräu biergarten in Bamberg. Despite having absolutely no experience selling soft-drinks (and precious little even drinking them) we immediately took a liking to this effervescent, floral, and fruity adult-friendly beverage. We did however suggest two tweaks—crank the hops a bit, and take some of the sweetness off. A year and many recipe-experiments later, we were sampled on the new-and-improved stuff in Bamberg by Jonas Seidl himself—and immediately placed our first orders to get it into the U.S.
Hopster is produced in Bavaria at the Kondrauer Mineral – und Heilbrunnen, which mixes its award-winning mineral water with tea and lemon essence and a distillation of essential Hallertauer Traditional, Taurus, Perle and Cascade hop oils. Its strikingly spritzy, fruity, and gently bitter aroma is followed by a dry, clean lemony palate. Refreshing by itself, it’s also the perfect mixer, and an excellent non-sugary, non-alcoholic option for the hop-loving teetotaler or designated driver! **Note — anti-fans of citrusy American hops will be delighted with the aroma of the original German nobles….